Oral health is a major issue for dogs, with more than 80% of dogs developing periodontal disease by age 3. 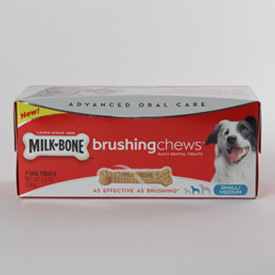 That’s why Milk-Bone®brand created Milk-Bone® Brushing ChewsTM, with a unique twist and nub design clinically proven as effective as brushing a dog’s teeth twice a week (based on the reduction of tartar build-up and bad breath). These tasty, affordable treats are an easy way to help brush dogs’ teeth. And that changes everything. DIAL® FOR MEN POWER SCRUB body wash is proudly over-engineered with grime cutting orange oil and micro scrubbers to give you a deep down clean you can be proud of. The advanced, micro-scrubbing formula removes dirt and oil while defending against odor all day – all without leaving your skin dry. 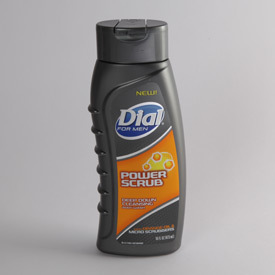 Bring Power to the Shower with Dial For Men Power Scrub Body Wash. Also available in Bar Soap. Get 10 benefits in 1 simple step with the power of pure Argan Oil! 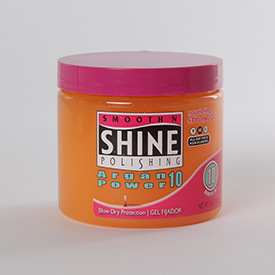 This nourishing styling gel gives you all-day hold while moisturizing and conditioning your hair. Doesn’t your hair deserve to be a perfect 10? 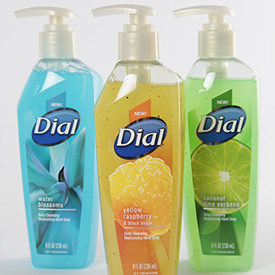 Dial Deep Cleansing Hand Soap’s innovative new formulas provide vibrant scents, refreshing moisture and gentle micro-scrubbers for an invigorating hand washing experience. The boutique design compliments the décor of any kitchen or bathroom. Whether it’s sparkling fresh Coconut Lime and Verbena, the refreshing citrus of Yellow Raspberry & Black Sugar, or the elegance of Water Blossoms, these exemplary formulas will delight and satisfy with unique sensations. safe and gentle on the most sensitive skin. No need for water or creams. 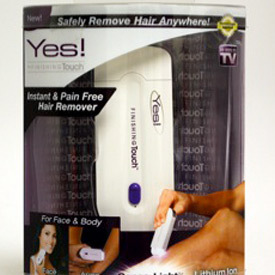 Use anywhere there’s unwanted hair – safe on all skin types and colors. Powered by a rechargeable lithium battery. Rough and bumpy skin on the back of arms and thighs is both frustrating and embarrassing. 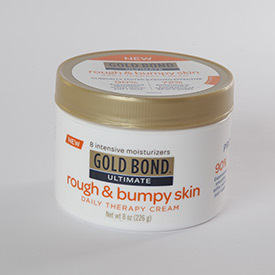 Fortunately, Gold Bond Ultimate Rough & Bumpy Skin Daily Therapy Cream is a daily body moisturizing treatment that goes beyond ordinary body lotion to smooth and soften extremely dry, rough skin and even helps reduce the appearance of bumps. Proven 2-in-1 formula combines a triple exfoliating complex with 8 intensive moisturizers that first slough off dead skin and then condition extremely dry or bumpy skin. 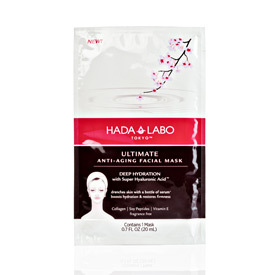 Skin becomes consistently smoother, softer, and less bumpy. 90% experienced smoother, softer skin in just 1 week. 72% reduction in bumps/the appearance of KP in 4 weeks. 89% experienced consistently less bumpy & significantly softer skin in 4 weeks. 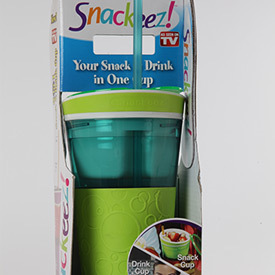 Have your favorite drink and a delicious snack all in one convenient container with the Snackeez Snack and Drink Cup. A sealed lid keeps snacks fresh, clean and ready to take with you. The capped straw prevents spills and leaks. A tight seal eliminates messes. It’s dishwasher safe for easy cleanup. Each item features a 16 oz cup and room for a whole single-serving bag of chips. 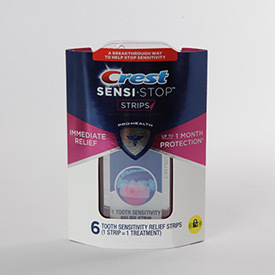 Crest Sensi-Stop Strips is a revolutionary product technology that allows consumers to get sensitivity relief like never before. This product combines a professional-level ingredient with Crest’s strip technology to create a truly breakthrough and effective way to treat tooth sensitivity. With Crest, the right amount of tooth sensitivity treatment is applied exactly where it is needed. One strip applied for 10 minutes provides immediate relief and up to 1 month of protection from sensitivity pain. 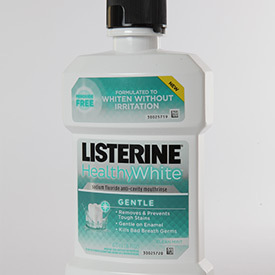 New LISTERINE® HEALTHY WHITETM Gentle Rinse offers effective teeth-whitening results. The unique formula safely whitens teeth and is the only leading whitening mouthwash on the market that does not contain peroxide but includes the added benefit of fluoride to restore enamel, offering a gentler, non-irritating whitening experience while simultaneously preventing cavities and killing bad breath germs. You don’t have to give up the foods you love, but you may need to think a little more carefully about how you consume them. You can also help protect your teeth with ProNamel® toothpaste. It is specifically designed to re-harden acid softened enamel. 1.Helps protect enamel against the effects of acid erosion 2. Restore natural whiteness by gently removing stains 3.Effectively clean and freshen breath 4.Provide cavity protection 5. Maintain healthy teeth and gums when brushing twice daily. 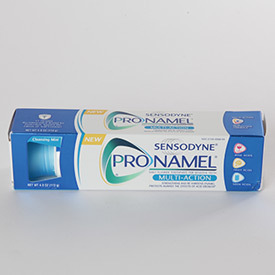 ProNamel® Multi-Action is also specifically formulated to be suitable for people with sensitive teeth. 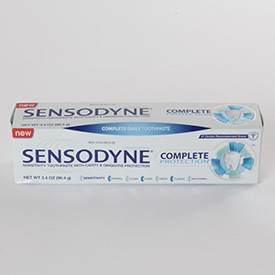 over sensitive areas to shield you from the pain of sensitive teeth 2. strengthens & re-hardens enamel 3. helps protect against plaque 4. helps maintain healthy gums 5. freshens breath 6. helps restore natural whiteness 7. gives a clean feeling Sensodyne Complete Protection toothpaste builds a protective layer over the vulnerable areas of your teeth and gives you all the oral care benefits you need in one complete sensitivity toothpaste. 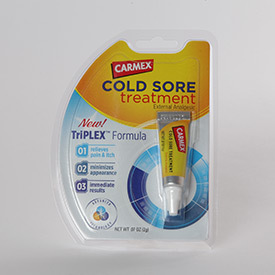 Only NEW Carmex® Cold Sore Treatment works on contact to block pain and itch while minimizing the appearance of a cold sore. 10% Benzocaine blocks pain and itch, while the TriPLEXTM Formula technology smoothes and fills to make the cold sore less noticeable. And, it works on contact – so you see and feel results fast. While no product can cure a cold sore, this breakthrough product can help sufferers feel more comfortable and confident! Now you can get all the cooling, drying power of Gold Bond Powder in a refreshing no-mess spray. The continuous, focused spray delivers powder right where you want it and the 360° valve lets you spray it in any direction – even upside down. With Gold Bond Powder Spray, application is both quick and easy. 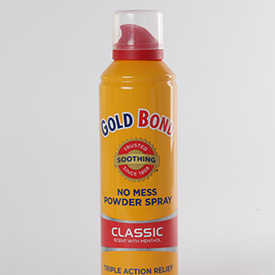 Gold Bond Powder Spray provides triple action relief with two great scents: Classic Scent with menthol and Fresh Scent with aloe. And it’s great to use before work or physical activity, or right after showering to stay cool, dry and comfortable all day long. Always®, the global leader in feminine protection, is revolutionizing the way women manage bladder leaks with its newest innovation, Always® Discreet for sensitive bladders. The new product line is available in liners, pads and the comfort of underwear that offers incredible comfort, protection and discretion. Always Discreet offers the perfect combination of absorption, comfort, odor protection, plus a discreet fit that helps make bladder leaks feel like no big deal. Nearly one-in-six children ages 4 – 12 in the United States wet their beds. The emotional toll on families is extensive, hurting children’s confidence and frustrating parents. 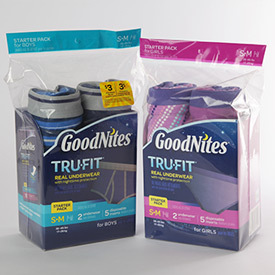 Kimberly-Clark’s GoodNites® brand – the leading manufacturer of bedwetting management solutions – has introduced TRU-FIT*, real cotton-blend underwear with disposable, absorbent inserts. This revolutionary product looks, washes, and feels like regular underwear and provides the nighttime protection to help keep sheets and pajamas dry all night. Eighty-seven percent of Moms who tried TRU-FIT* said it will make their kids more confident. 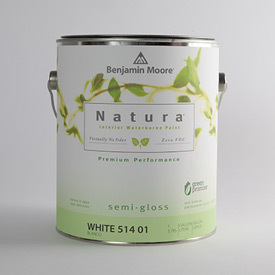 Natura® Interior Waterborne paint provides an environmentally friendly, Zero VOC and zero emissions option when it comes to painting home interiors. Formulated with proprietary raw materials and the greenest possible practices, Natura was recently granted a patent for the technology and manufacturing methods that contribute to its high performance properties. Natura dries quickly to allow full, same day use of the newly painted room. 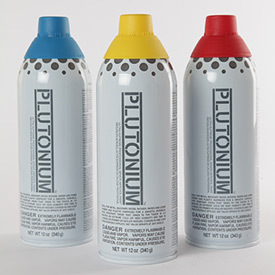 Plutonium exterior/interior aerosol paint is a unique acrylic lacquer which provides a premium coating that resists dripping, chipping, cracking and peeling. It can provide up to 2 1/2 times the coverage, is fast drying (3-5 min), mold, mildew and fade resistant with UV protection. As a HVLP (high volume low pressure) color delivery system, it dries faster, covers better and lasts longer. Best applied with Pro-caps 6 pack actuator kit. Made In The USA. 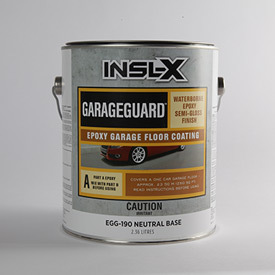 Garage Guard® is a durable water-based 2-part epoxy coating for use on garage floors, basement floors and other interior concrete surfaces. Garage Guard provides an incredibly hard, chemical, abrasion and impact resistant coating to make surfaces look new again. Easy to apply and sets up in 72 hours to allow vehicles park to on, makes this ideal for a weekend home improvement project. this indulgently smooth AND crunchy treat. 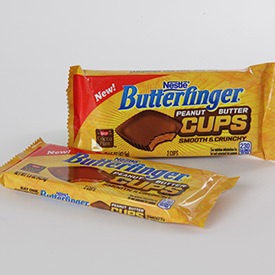 Each cup features a smooth, super peanut-buttery Butterfinger filling with the perfect amount of crunchy Butterfinger pieces mixed in, surrounded by delicious, rich milk chocolate. An irresistible combination that is sure to leave your chocolate craving satisfied! 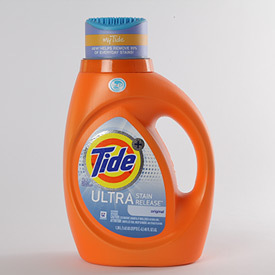 Tide Ultra Stain Release is Tide’s newest liquid detergent supercharged to help remove 99% of everyday stains, including greasy food stains! It also boasts the innovative “Zap! Cap,” a unique pretreat cap with scrubbing bristles to pre-treat tough stains. Put Zap! Cap to work for you with Tide Ultra Stain Release–helps remove 99% of everyday stains! 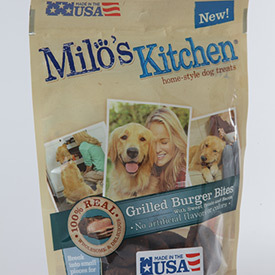 Milo’s Kitchen® brand believes that dogs deserve treats made with the same quality and care that people want with their food. So they’ve made it easy to give dogs the great taste of grilled burgers. New Milo’s Kitchen® Grilled Burger Bites are made from a delectable home-style burger recipe with real beef and real pieces of bacon and sweet potato. It’s wholesome, authentic beef burger taste—no need to fire up the grill. Made right here in the USA. Always® Infinity – the world’s first foam pad – is the biggest innovation in femcare protection in the past decade. 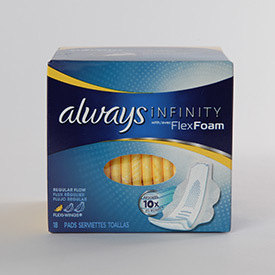 While most pads are made of cotton fluff, Always® Infinity is designed with patented FlexFoam material that revolutionizes comfort and protection. Its microholes help the pad magically absorb 10x its weight, while its form-fitting channels let it mold to your body. This amazing pad is made to do anything you can! 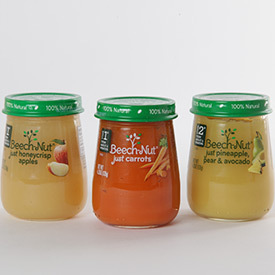 At Beech-Nut, homemade is our inspiration – we don’t want moms to feed their babies anything they wouldn’t eat themselves. That’s why we developed the new, 100 percent all-natural Beech-Nut line with input from everyday moms. Just real, whole fruits and vegetables are inside our jars. And nothing else. Our food looks, smells and tastes like real food because it is real food. This is not baby food. This is real food for babies. Fresh from the Caramel Shoppe, we’re now bringing our smooth, creamy caramel to popcorn! 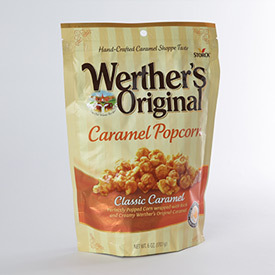 Discover Werther’s Original Caramel Popcorn – perfectly popped corn wrapped with the one-of-a-kind taste of Werther’s Caramel.Perfectly popped corn wrapped with rich and creamy Werther’s Original Caramel. The Caramel Popcorn for Caramel Lovers! 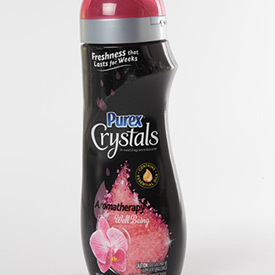 Refresh your laundry and renew your spirits with the new Aromatherapy line of in-wash fragrance boosters from Purex Crystals. Available in 3 fragrance “moods” – Well Being, Energy, and Serenity; each infused with natural essential oils to deliver just–washed freshness that lasts for weeks. Simply add at beginning of wash to put a little bliss in your everyday. 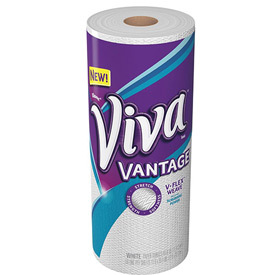 This year, Viva® brand launched a NEW cleaning solution – Viva® Vantage*. Viva® Vantage* has a new revolutionary V-Flex* Weave technology that delivers stretch for great scrubbing power. 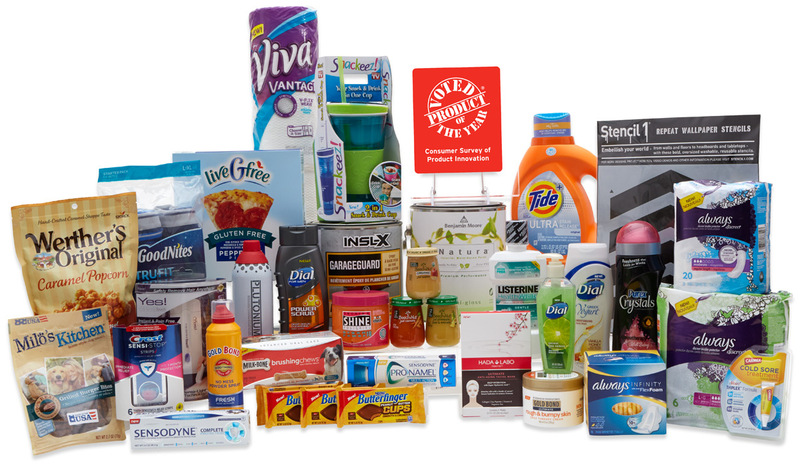 Consumer testing shows that more people prefer Viva® Vantage* over the National leading brand and that it provides the best texture for cleaning to take scrubbing to a whole new level. Visit towelbreakup.com to learn more about Viva® Vantage* and to see why the stretch makes all the difference. 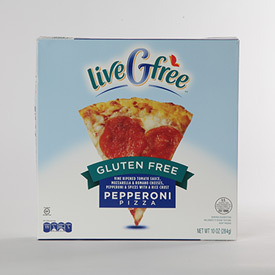 ALDI-exclusive LiveGfree Gluten Free Pizza is made from organic, gluten-free ingredients. Vine-ripened tomato sauce, mozzarella and Romano cheeses, uncured, nitrate-free pepperoni and spices top a rice crust. The new LiveGfree product line is made from the most premium quality gluten-free ingredients to provide you with a worry-free diet that tastes great and offers wholesome and tasty alternatives across a wide variety of products. 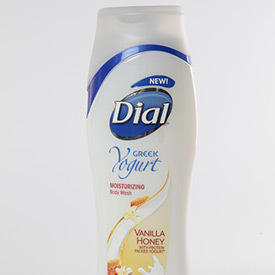 Introducing new Dial Greek Yogurt Vanilla Honey Body Wash, with protein packed yogurt for deliciously soft skin. With two times the protein nourishment of ordinary yogurt, this ultra-hydrating body wash conditions skin to help it retain natural moisture. Its rich lather rinses clean, for lasting refreshment skin needs to stay healthy. Stencils are the hottest DIY trend of the season, and Stencil1 leads the way with its iconic designs and streetwise style. Stencil1’s Repeating Pattern Kit is a must-have for makers. Create custom wall treatments to match your style without the hassle— and permanence—of wallpaper. 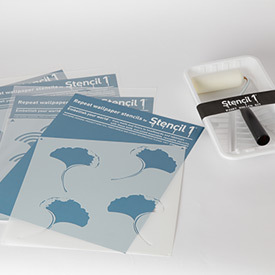 Each kit includes a laser-cut Stencil1 stencil, a paint tray, and a dense foam roller for precision application.